Harbor City's property owners hire J&J Fence because we have one of the best reputations in the South Bay for high quality iron, chain link, wood and vinyl fencing. We are also well known for our expert installations of roll up doors, window bars, handrails, folding gates and steel staircases. Since we specialize in custom work, we are able to accommodate just about any perimeter, decorative or security fence project. Call today to learn more. Our professionals are happy to visit your site and provide a free consultation and price estimate. Our business is family-owned and -operated, and fully licensed, bonded and insured. We never use subcontractors. Instead, we pride ourselves on having a completely trustworthy and highly experienced staff (they average 15 years of industry experience). As if that weren't enough, our ownership supervises every aspect of every project to ensure proper quality control. Whether you have requested a standard design or original custom work, you can trust that we will stay as close to your vision as possible. Call now to schedule your free consultation and estimate. 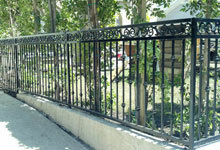 We provide Harbor City with a complete range of iron fencing services for decorative or security purposes. 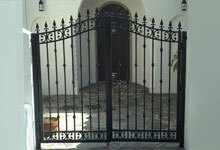 Our ability to handcraft our iron allows us to design your fence to your exact specifications, style and needs. Because we offer a wide array of iron, we are also able to accommodate most budgets. 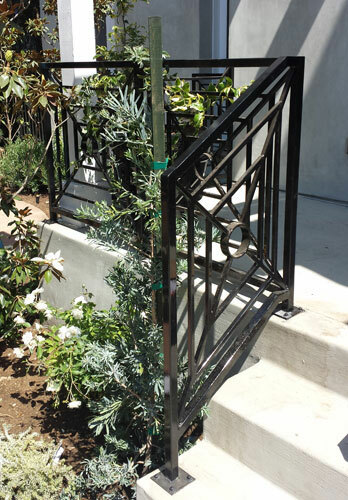 For those seeking a decorative fence, railing or window grill, we generally recommend our ornamental iron, which can be embellished with stars, medallions, scrolls and more. For sturdy construction at an affordable price, our security iron meets most needs. Finally, our wrought iron fabrications are often reserved for those homes and businesses whose owners want to invest in the best. In every case, we can galvanize, powder coat and paint your iron any color you desire. Chain link can be used for a wide variety of applications: residential or commercial fencing, kennels, storage areas, high security fencing, tennis courts and more. It can be left open for visibility or adapted with windscreens or slats for privacy. Depending upon its use, you can decide to use a lighter or heavier gauge, or add a few strands of barbed or razor wire along the top of the fence. Talk to one of our team members to determine what kind of chain link will best suit your needs. 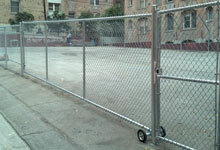 We use the fence industry's best practices for installing chain link fences on Harbor City properties. 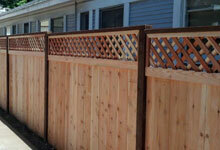 Many home and business owners in Harbor City are passionate about wood fencing. At J&J Fence, we understand this passion and aim to construct a fence worthy of your vision. We use the finest redwood and cedar to build handcrafted picket, stockade, ranch rail, tongue and groove, post and rail and custom-designed fences and gates. We can also add hide or feature ironwork throughout the fence for added sturdiness. Call today to learn more about how we can build a wood fence to meet your needs. We have found that many of our Harbor City clients love the look of wood fences but dread the amount of work required to maintain them. Vinyl is often the material they settle on when they hear all of its benefits. It never rusts, blisters, peels, or rots; resists termites; requires no painting or other maintenance; and comes with a lifetime warranty. While a vinyl fence may cost a bit more than your traditional wood fence, vinyl is definitely worth the investment. 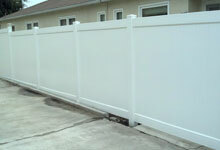 Like all of our other fences, we can construct your vinyl fence to any width, height and design. J&J Fence's fence professionals have the ability and expertise to construct a custom gate to perfectly fit any space and match any fence in Harbor City. Since we excel in using a number of mediums, we can even provide a number of new designs to elevate the look and originality of your fence. We can also install roll up doors or folding gates. Additionally, we can equip any gate with automated gate operators, remote controls, security controls and more by the best names in the industry: DoorKing, Chamberlain, Linear, LiftMaster and more. Call us today for a no-obligation consultation, and free price estimate.